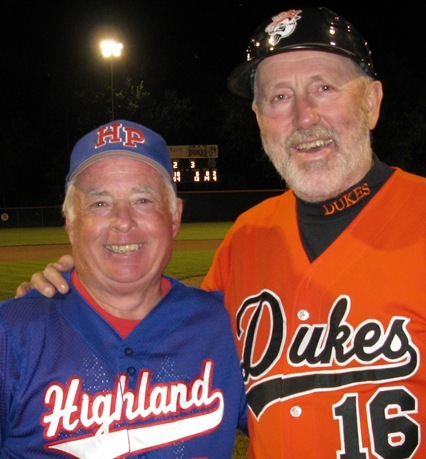 The Dundas Dukes beat Highland Park 13-6 in a non-conference slugfest last night at Memorial Park in Dundas. Among the highlights was Dukes manager Bill Nelson taking a screaming liner to the jaw while sitting in the dugout. He recovered in time to savor the victory over his long-time colleague, Highland Park Manager Jim Lawton. Robbie and I were the guests of Hizzoner Glenn Switzer and the First Lady of Dundas, Michelle Millenacker. The Mayor’s box seats are saaaaweeeeet! Previous PostThe Dukes and the Knights play at home this weekendNext PostWhere is this?